Find lost dog- win fabulous prizes: Dog is found. Larkin has lost found Macy. 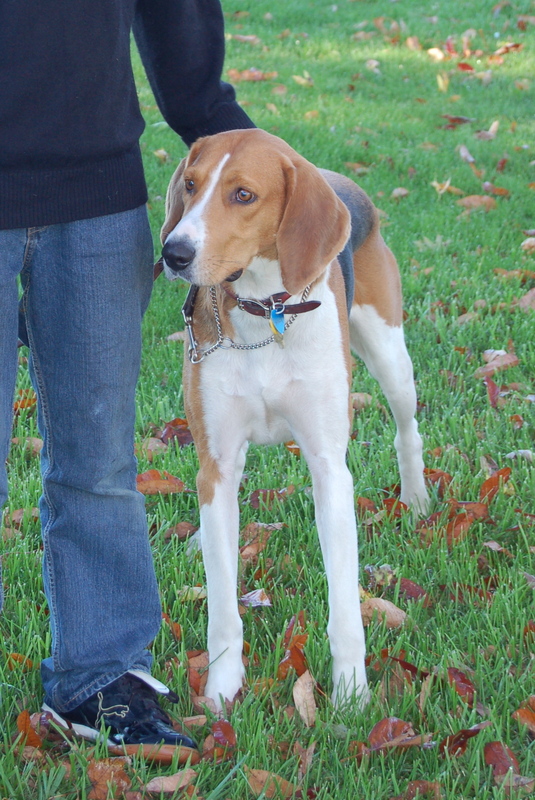 Macy is an American Foxhound, she is very friendly, but a bit timid and will probably be pretty frightened. She was last spotted this morning about 12:20 a.m. in the area of Broadway and Superior, but she could be anywhere. There is $100 for her return. Macy was found this afternoon about 2:30 EST. I camped outside the Hospice of Dayton (what nice people!) from about 8 a.m. I took a couple of breaks and on one of them she was sighted at the hospice again. (And it was great to know she was still in the area.) Ransom and I took a walk in the woods behind the hospice looking for her. Here’s an aerial photograph: http://snipurl.com/71n76 [www_mapquest_com] –it’s that long stretch of woods in the middle, most of which is enclosed with an 8 foot chain link fence. We did find the place where she was going under the fence into the enclosed area. Back to the car, more waiting and watching. About 2:10, I decided to drive around the area on the other sides of the woods. At 2:15 my cell phone rang: it was the hospice, Macy was back. I rushed back there only to be told that she had bolted back into the woods. A man from maintenance was still calling for her, and I went back to the truck for Ransom, our Chesapeake Bay Retriever. Ransom was particularly pleased to meet the maintenance man, and began a conversation with him of loud conversational barks and roo-ing. That was when I saw Macy in the woods, peering out. I called her softly and she came towards me, but she was still leery of the other person. He graciously stepped back, I sat down on the ground, and she flew to me. She seems to be in pretty good shape, other than the fact that she is emaciated. I don’t think she ate much while she was gone…. and while the psychic was correct that she was in an enclosed area– and Monday was the day this all started to come together– no one was looking after her. The cold, anxiety, exercise and lack of food really made her very thin. She was very eager and happy to greet the rest of her pack, and the general feeling in our household is one of great relief, well-being and contentedness. The people of Dayton were simply marvelous during all this. They took a great interest in Macy and her well-being. Without exception, all were extraordinarily kind– and I saw parts of this city that I didn’t even know existed! Your prayers and kind thoughts really helped to sustain us during this very difficult last week and we are so grateful to you. My Christmas came extra early this year. I’m so sorry, Larkin … thinking good thoughts for you and Macy. I really hope you find Macy, and I too am thinking good thoughts for you! Many thanks… and to everyone who is keeping a special eye out, please keep looking! She’s still out there. We took one of the other dogs with us tonight while cruising every alley in West Dayton and Susanna got extraordinarily intense from time to time, but we just couldn’t find Macy. We will continue to try. I’ve alerted bus drivers, letter carriers, the shelter, the soup kitchen, all the neighbors, my son’s school, the 5th District PD. As soon as the weather dries a little I am going to post more notices. She has a microchip and the microchip company has alerted all the vets, shelters and “pet rescuers” (volunteers) in a 25 miles radius. I posted her photo on Craigslist. If anyone can think of some more stones I can turn over, I really welcome your suggestions. Thanks again for your kind thoughts. If you would be willing to send this note out to everyone local on your email list, and ask them to do the same, I’d really appreciate it. The more people that know, the better the chances of finding her. Just an update for the curious…. no sign of her, dead or alive, so we still have reason to hope. 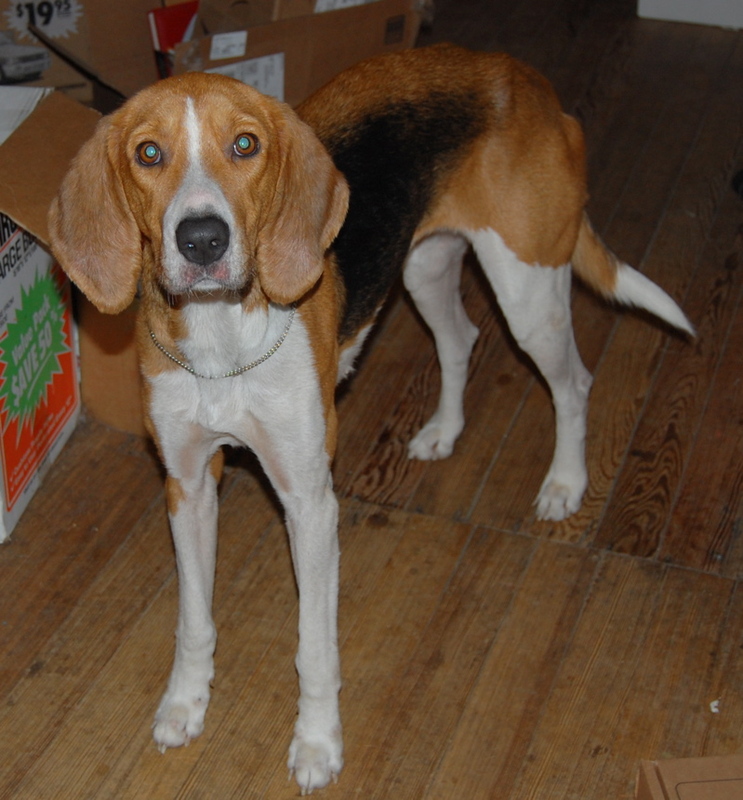 I believe that she is probably still in the Dayton view area, but a friend with a Foxhound found him 175 miles away after four months of looking… If you see her, if you think you see her, please let us know, and thanks for continuing to be on the lookout. Is she microchipped? I’m in Vandalia, but I’ll keep my eyes open. I have 2 little pugs that I love like children, I hope she’s home soon. Larkin stopped by about 2 hours ago- with a very skinny Macy. She’d been behind Hospice of Dayton- and is now at home. Thanks to all- I’m sure Larkin will post an update. YAY!!!!!!!! So glad and thankful. Congrats, Larkin, on getting your girl back! I would love to know how she got all the way across town, especially with the traffic. Thank goodness. What a wonderful early Christmas present for you! Best wishes to all of you.